Shanghai cuisine is highly regarded, coming from the eastern Chinese school of food preparation. Generally not as spicy as Sichuan dishes from the west of China, nor as salty as Beijing fare, Shanghai/eastern China cuisine makes use of the vegetables cultivated in the fertile farmlands around the Yangtze River and fish from the nearby coastal regions. It’s known for being a bit sweet, due to the Shanghainese penchant for cooking with rice wine. With China’s history of famine, no food is taboo in Shanghai. In local Shanghainese food markets you can find snakes, chicken feet, locusts and frogs. Decades of foreign influence have turned Shanghainese palates on to dairy products and baked goods, both of which are available all over the city in local supermarkets and restaurants. Dumplings - Dumplings are a Chinese and Shanghainese specialty, held in high regard, and their preparation is taken very seriously. 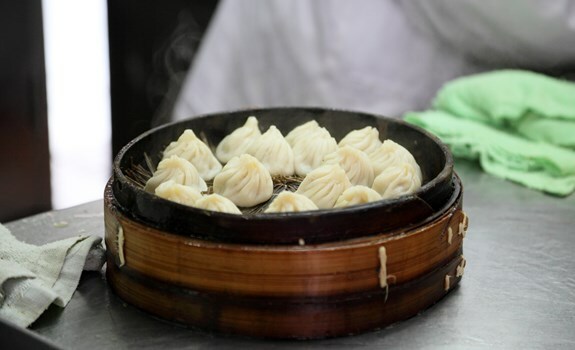 Shanghai dumplings are known locally as xiaolongbao and are filled with meat or seafood. The skin is very delicate so that the juices ooze out into the broth, giving the soup a stunningly rich flavour. In the morning, try baozi (steamed buns). These popular Shanghai breakfast items are round with a thick fluffy skin. On the inside, you’ll find a filling of either meat or vegetable. Hairy crab - These fill the streets and fuel the city every year from September to December. When locals aren’t feasting on them in their homes, they’re eating them in family restaurants or opulent banquet halls. Raised in fresh water, hairy crabs are revered for their firm orange roe and uniquely flavoured meat. Shanghai also specialises in cold dishes, which are normally served at room temperature. They include jellyfish flavoured with sesame oil, mashed soybeans and, no joke, drunken chicken or shrimp. In drunken dishes, the animal is doused in rice wine until the flavour permeates the meat. Drawn by its rampant economic growth, migrants from all over China come to Shanghai, bringing their regional tastes with them. Consequently, you can enjoy the entire spectrum of Chinese food. In Shanghai, you can get stews from what was once Manchuria, roast mutton from Xinjiang, duck from Beijing and dim sum from Hong Kong. Before you’re ready to confidently walk into a local hole-in-the-wall family diner and pick apart the Chinese menu, have a meal or two at one of these restaurants.